Subretinal fibrosis contributes to the loss of vision associated with age-related macular degeneration (AMD). Retinal pigment epithelial (RPE) cells play a key role in the pathogenesis of AMD including the fibrotic reaction. We examined the role of retinoic acid receptor-γ (RAR-γ) in the epithelial-mesenchymal transition (EMT) and other fibrosis-related processes in mouse RPE cells cultured in a type I collagen gel. Transforming growth factor-β2 (TGF-β2)–induced collagen gel contraction mediated by the RPE cells was inhibited by the RAR-γ agonist R667 in a concentration- and time-dependent manner. 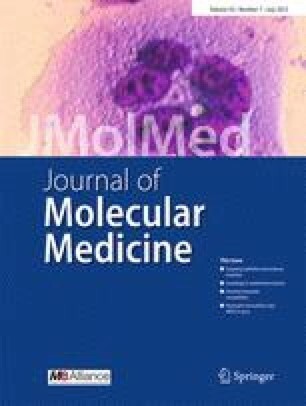 Expression of the mesenchymal markers α-smooth muscle actin and fibronectin, the release of interleukin-6, and the phosphorylation of paxillin, mitogen-activated protein kinases (ERK, p38, and JNK), Smad2, and AKT induced by TGF-β2 were also suppressed by the RAR-γ agonist. Furthermore, gelatin zymography and immunoblot analysis revealed that the TGF-β2-induced release of matrix metalloproteinase (MMP)-2, MMP-3, MMP-8, and MMP-9 from RPE cells was inhibited by R667, and the MMP inhibitor GM6001 attenuated TGF-β2-induced RPE cell contraction. Finally, immunohistofluorescence analysis with antibodies to glial fibrillary acidic protein showed that R667 inhibited the development of subretinal fibrosis in a mouse model in vivo. Our results thus suggest that RAR-γ agonists may prove effective for the treatment of subretinal fibrosis associated with AMD. RAR-γ agonist R667 suppressed collagen gel contraction mediated by RPE cells. Epithelial-mesenchymal transition (EMT) in RPE cells was inhibited by RAR-γ agonist R667. RAR-γ agonist R667 inhibited fibrosis-related processes in RPE cells. RAR-γ agonists may attenuate AMD-associated fibrosis. This study was supported by Takeda Science Foundation. We thank Yukari Mizuno and Shizuka Murata for technical assistance.